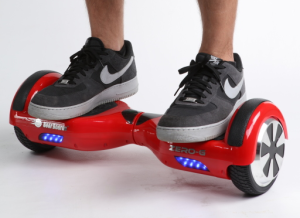 If you’re a hoverboard rider, please stop. I have decided they are ridiculous and useless, so please stop riding them. First of all, they don’t even hover; they have wheels. These contraptions are essentially skateboards with two giant wheels on the end instead of four on the bottom. It’s like someone wanted to market a Segway to an angsty 13-year-old. But the problem is, real adults are using them. Hoverboard lore dates back to “Back to the Future II,” a movie that depicted hover boards as boards that actually hover. Off the ground. Without wheels. Lexus has developed an early version of a hoverboard that uses magnets and not wheels to hover above the ground. This isn’t magic. It’s science. These wheeled hoverboards can achieve top speeds of an exhilarating 12 miles per hour. If the near-human-speed-of-running wasn’t enough of a sell for you, consider this: you can only ride hoverboards on level, flat, dry land. That means no cracks, puddles, slopes, stairs, hills or rocks. Riding them through crowds is also a very unsafe idea. Inclement weather will most likely cause your board to malfunction, so good luck getting back home from work if you’re using that embarrassing piece of garbage. The wheeled hoverboard’s popularity can be traced back to a few things. First, its name: people still refer to these boards as hoverboards, which makes the thing sound a lot cooler than it actually is. According to its Wikipedia page, the contraption is technically known as a “self-balancing two-wheeled board.” Not as catchy, but way more accurate. And second, celebrities have helped spread this hoverboard craze to the masses. Stars including but not limited to Lily Allen, Wiz Khalifa, Kendall Jenner, Justin Bieber and my personal favorite, gatekeeper of good cultural taste, Chris Brown have all been spotted riding on hoverboards. Something about watching celebrities stand on a piece of plastic and move makes everyone else want to do the same. I’m not alone in my hatred of hoverboards either. In fact, the entire United Kingdom agrees with me. In the UK it is illegal to ride a hoverboard on a public street or sidewalk. This means that people have to keep their hoverboard riding to themselves, and rightfully so. Starting at somewhere around $270 you can buy a hoverboard (with the supercool name of “adult transporter”) on Amazon right now. But please do yourself and your friends a favor and don’t. There has been an emerging market for these hoverboards, with two of the larger creators, Hovertrax and IO Hawk, in fierce competition. Who knew the hoverboard business was so nasty. Additionally, nearly every company imports the same base parts from China, and makes slight aesthetic changes to the same basic board. So basically, no matter which hoverboard you buy, you’re still putting your money toward a piece of cultural trash. During the few times I’ve seen a hoverboard in person, I’ve had to look away and let out an eye roll. I can’t believe people would spend money on something so vile and pretentious. Buy a month’s worth of groceries, go to a few concerts, buy a puppy. But whatever you do, please don’t buy a hoverboard. ← Are Vijay Kumar’s flying robots the future of agriculture?